Last July, the Juno mission became the second in history to establish an orbit around the largest gas giant and planet within our Solar System: Jupiter. The mission has brought scientists interesting information about the planet, including observations and data taken about its atmosphere, gravity, meteorological phenomena, and strong magnetic fields. Celebrating Juno’s one year of orbit this year (July 4th at exactly 7:30 PM PDT) also means that the spacecraft has traveled a distance of 71 million miles. 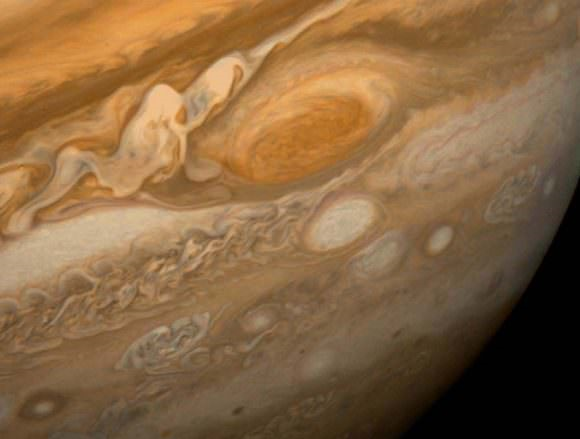 Only a few days after this historic moment, on July 10th at 7:06 PM PDT, Juno passed directly over Jupiter’s most famous feature: the Great Red Spot, a giant anticyclonic storm. This focal point of scientific study was first observed by either Robert Hooke or Giovanni Cassini in the late 17th century, and astronomers had begun continuously observing the storm by 1830, noting its periodic expansions and regressions ever since. Currently, the Great Red Spot is 10,000 miles in diameter and reaches wind speeds of 286 miles per hour near the edges of the storm. When Juno passed close to Jupiter’s center (perijove), it was in part of its sixth orbit of Jupiter’s cloud tops. 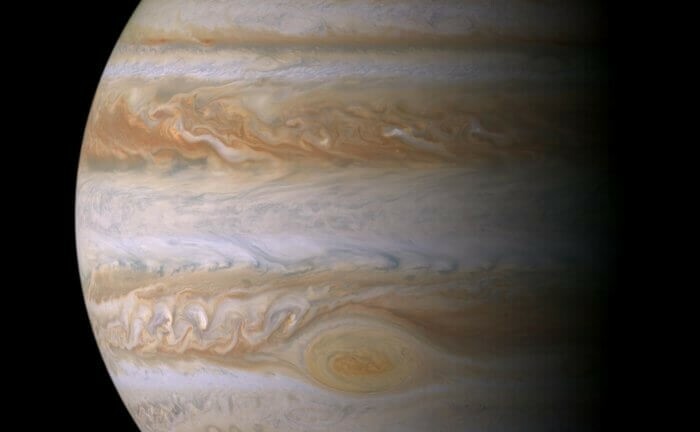 Only eleven minutes after passing close-by perijove, the spacecraft flew over the Great Red Spot at a distance of only 5,600 miles from the anticyclonic storm. This distance was historic because Juno became the closest spacecraft to fly the Great Red Spot! February 2018 is the set conclusion for the Juno mission, which will enable the spacecraft to complete six more orbits of Jupiter. Unless the mission is extended, the probe will be set to de-orbit and burn up in the outer atmosphere of Jupiter like the Galileo spacecraft. This is done to avoid impact and contamination of any of Jupiter’s moons. Though the fate of the Juno spacecraft may seem anticlimactic, it will still have brought us incredibly telling observations about the gas giant that resides so close to home! #GetExcitedSU!